Miniature Building Authority is proud to announce the release of our new 28mm Farmstead II and Farmstead wall set. As with the rest of our Miniature Building Authority products they come pre-painted and pre-assembled ready to put on the table and start gaming. The Farmstead consists of four buildings and two wall sections. The Farmstead Wall set consists of 4 straight wall sections and one gate section. The first item is our new Square Tower. This piece allows you to make corners in your wall, T intersections, or works great as a stand alone tower, just add a set of stairs to go with it. It has one door at wall height. The second item is our new Half Wall. This will give you more flexibility when making your wall layout. We’re taking you back to the Dark Ages! MBA is proud to release the new 28mm Dark Age Weaver building. This has a beautiful thatched roof that is removable to allow you to get in the buildings. As with our other products it comes pre-painted and pre-assembled ready to put on the table and game. One less project to worry about. We also got in restocks of our Dark Age Cottage. So with these two items and the Dark Age Smithy, your village is even more complete. We now have Modern Vehicles for sale. Miniature Building Authority’s line of Direct Terrain is proud to announce that we are now selling vehicles to go with our modern accessories. 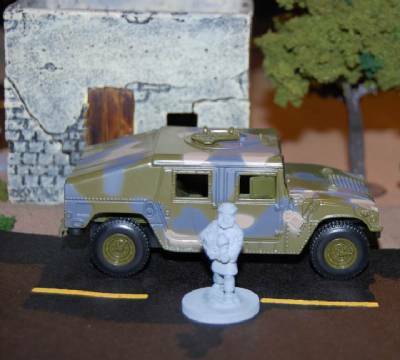 Both of these items are 28mm scale. 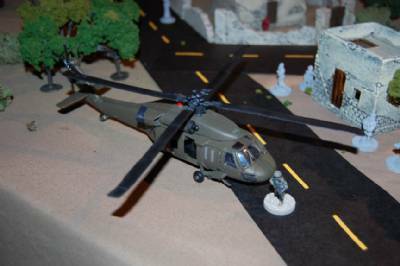 The HUMVEES and UH-61 Blackhawk helicopters are die cast and come pre-painted. Our line of Direct Terrain is proud to announce the restock of both the Pup tents and Dome tent. Both of these items are 28mm scale. The Pup Tents come painted and ready to use with two per package. The Dome Tent does not come painted and only one per package. Figures are not included. Check these out and all of our Direct Terrain items via our website. Our line of Direct Terrain is proud to announce the arrival of our Dumpster and resupply on our Iraqi Check Points. Both of these items are 28mm scale. They are unpainted and figures are not included.